Hand operated, high quality dispensing guns designed to accept all size cartridges for the manual application of sealants, adhesives, potting compounds, and other materials packaged in disposable cartridges or Techkit, Semkit multi-component materials. They are excellent for the in-field application of silicones, sealants, adhesives, pastes, and other materials. The ratchet handle is made of metal for tough, durable, long-term use. 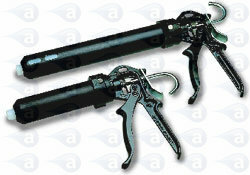 A bayonet retainer provides a tight fit into the ratchet handle, permitting uninterrupted operation. Custom size retainers accommodate 2.5, 6, 8, 12, 20 and 32 ounce size disposable cartridges. Cartridges allow use of standard nozzles with a 1/4" NPT thread attachment. Needle tip adapters can also be used with the cartridges for attachment of all standard dispense tips. All guns are covered by a 12 month manufacturers warranty.